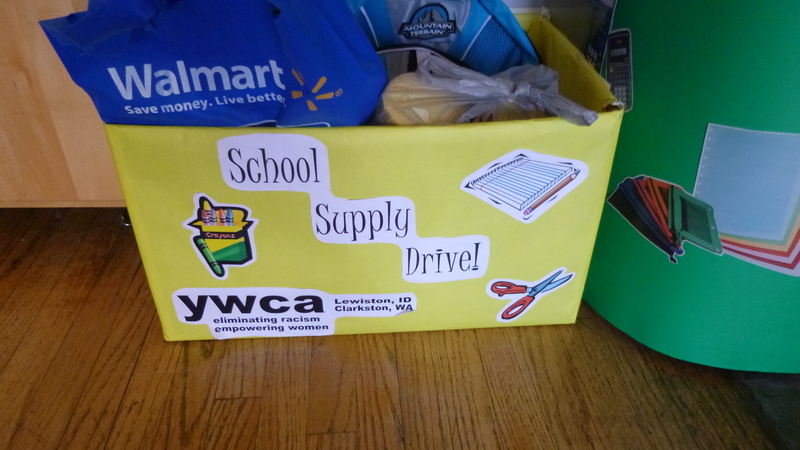 The first thing I did this morning was look into donation opportunities in Lewiston, and I eventually read about a school supply drive that was being sponsored through the YWCA. So I called them, but just got a message saying the business office is open on Mondays-Fridays. There was also a phone number for the person running this particular program, so I called that one also, but got the same message. 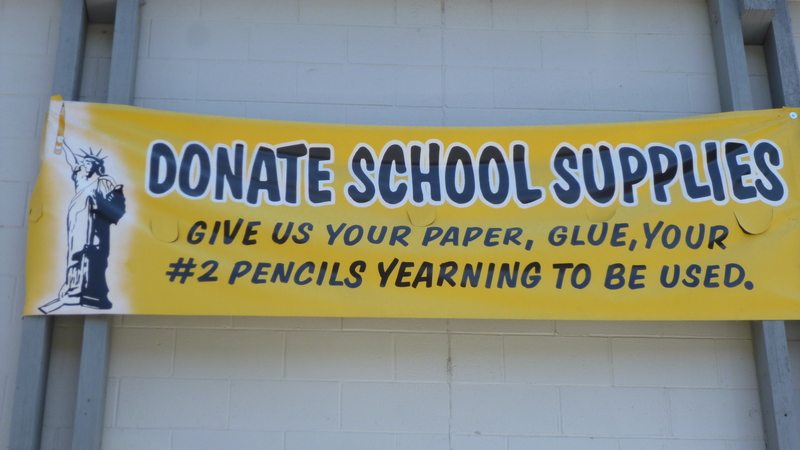 So I didn’t think I’d be able to do anything for the school supply drive. 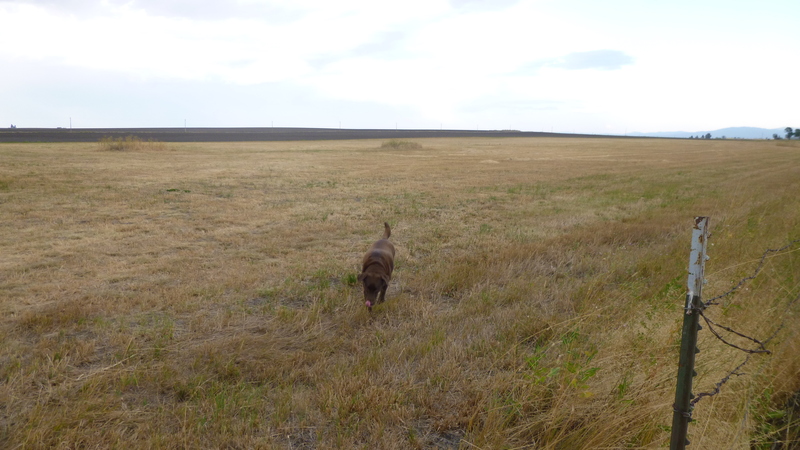 Tula and I set off to walk around Lewiston a bit. 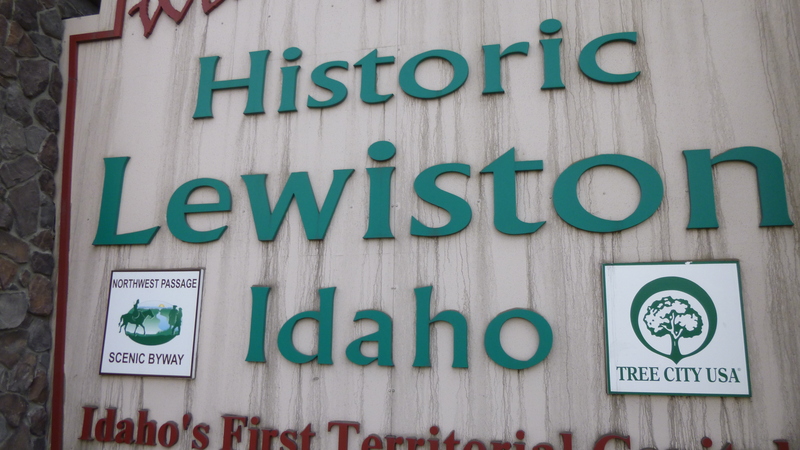 This town is named after Lewis and Clark (Lewis-Clark State College is located here too), and once again, I’m astonished at how much territory Lewis and Clark actually covered time and again. They didn’t have good maps (they were making some of the maps!) or modern transportation or roads, and still traveled all over the place. Amazing! 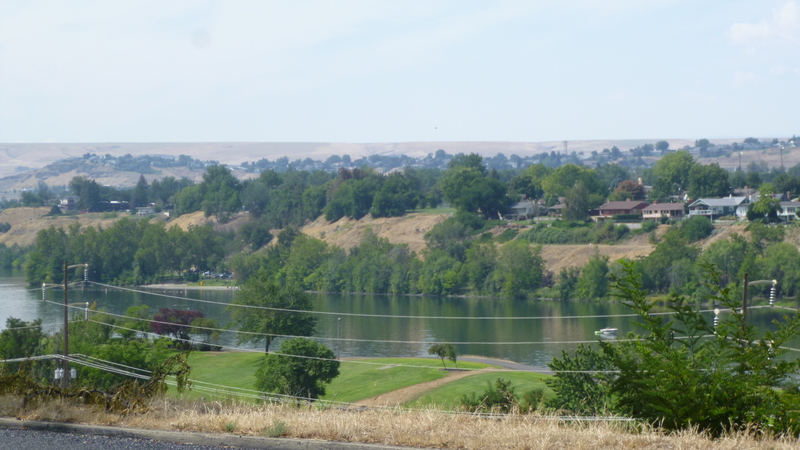 Tula and I walked through town, up a steep hill and into a neighborhood overlooking the river dividing Idaho and Washington. As we returned to the car, I walked right past the YWCA and saw a big sign on the side of the building asking for school supply donations. And then I noticed another sign about painting bowls, and that event was happening this morning, so there were people inside the building. 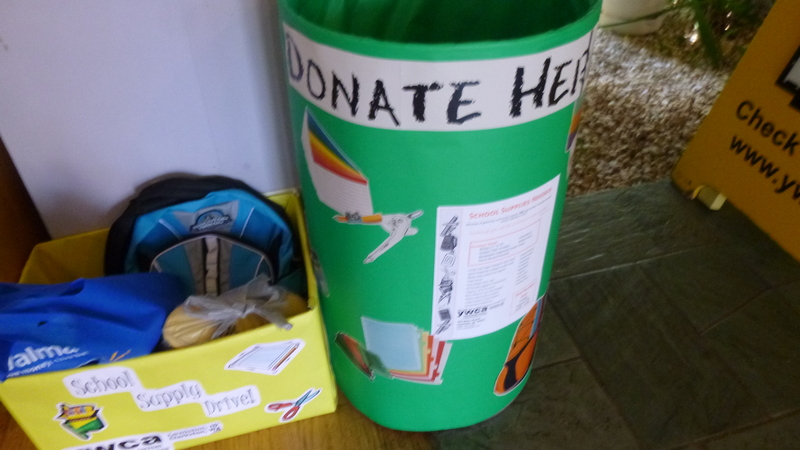 I went in to see about maybe making a donation after all, and ended up meeting the Nellie, the children’s advocate who was running the school supply drive. She wasn’t typically in on Saturdays, but had left some headphones behind yesterday, and came in this morning to get them, then stayed to paint a bowl. So we talked about the school supplies that were needed, and she gave me a list to take to the store, with some of the items highlighted. I went to Walmart and stocked up on calculators, crayons, pencil pouches, notebooks and dividers. The place was packed with families out school shopping, so it took me a while. I took the goodies back to the YWCA, and Nellie was just getting ready to leave. She wondered if I was going to be around next Friday, which was Distribution Day, because it’s quite a sight to see so many kids – hundreds of them – lined up, eagerly awaiting their backpacks and supplies. I’m happy I was able to make this donation after all! Nellie and I both thought it was coincidental that I showed up when she was there, on a day she wouldn’t usually be in – another one of those “meant to be” moments! 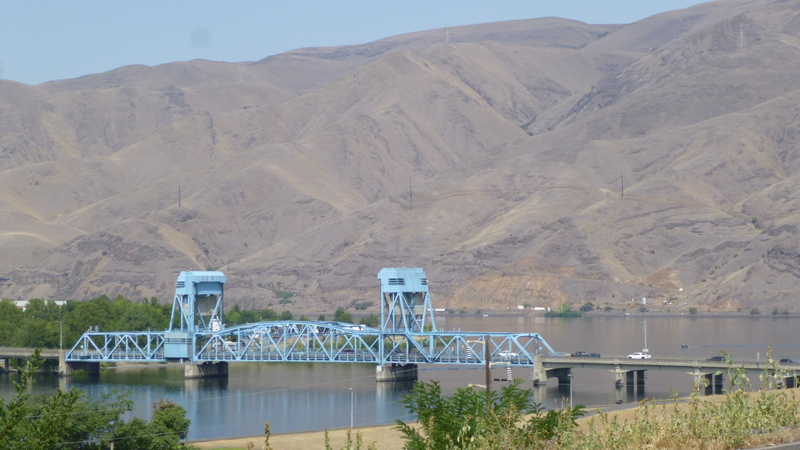 When I was done in Lewiston, I was going to start making my way farther south. 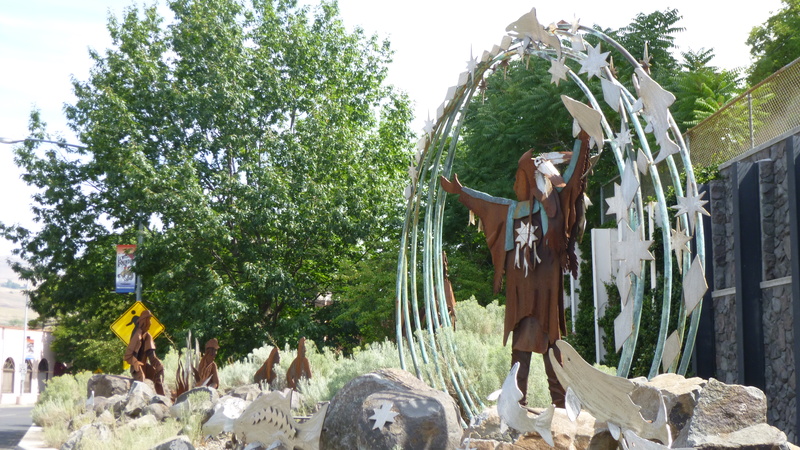 At the beginning of my Idaho week, I had planned to go to Craters of the Moon National Park, which is east of Boise. And I was also going to try to meet up with a good friend of my mom, who now lives in Boise. 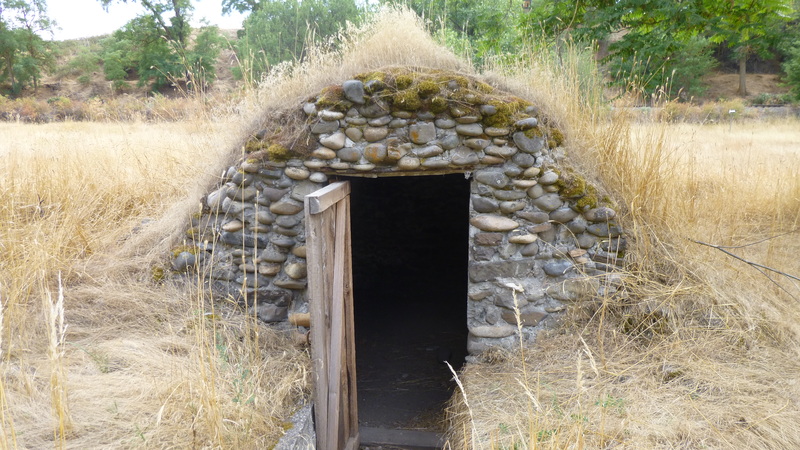 But after talking with both her and my dad, I realized I would have to revise my travel plans – there were some major wildfires east of Boise, up near the towns I had planned to see while going to Craters of the Moon, and I was going to have to pay more attention to them. There aren’t that many roads in the area, and we figured they would mostly be used for firefighting vehicles and evacuees – hundreds of households were now under evacuation orders. 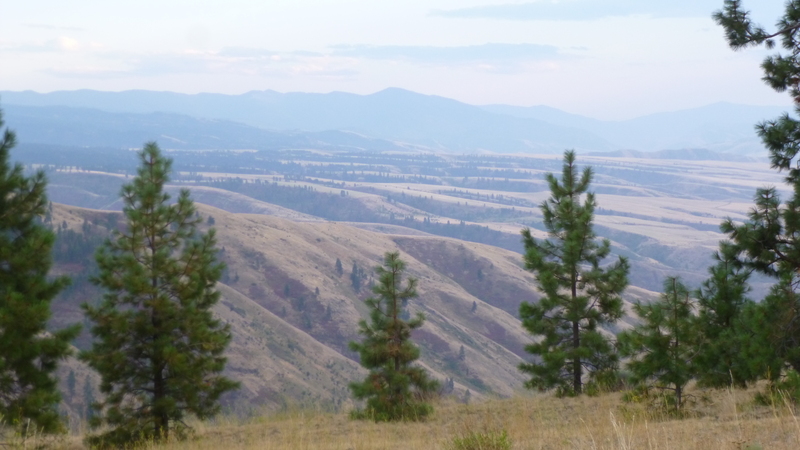 So I knew I could now take my time on the drive south toward Boise, because I no longer planned to head too far east into that part of Idaho. 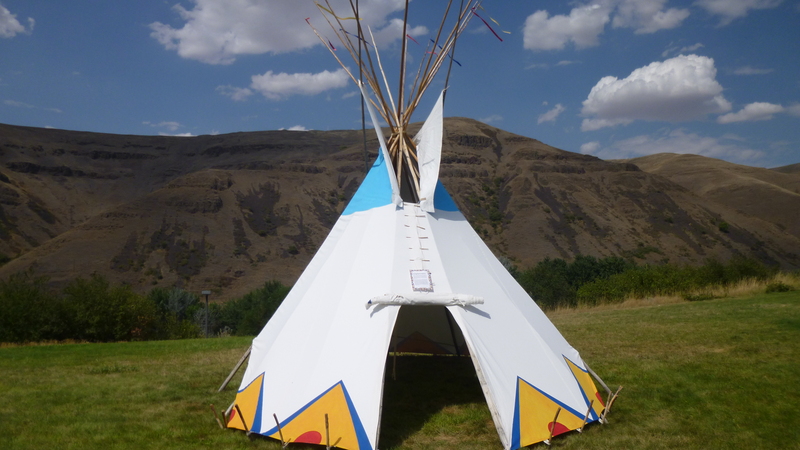 Not far outside of Lewiston, I came to one of the many Nez Perce National Historic Parks. 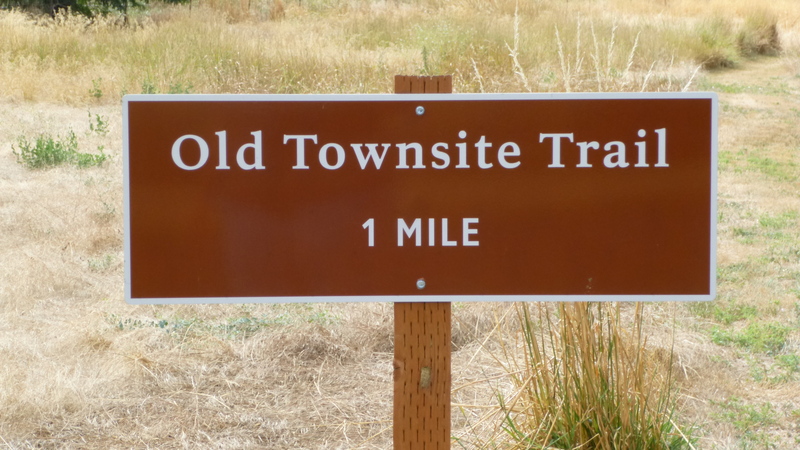 I saw a visitor center and stopped in, and then Tula and I walked on the few trails that were in the park – they had just cut a new mile long one. It’s hot out, and a mile or 2 at a time is all Tula is up for in the heat. But other than seeming to be a little sensitive to the sun and heat (side effects mentioned on her medication) she seems to be doing very well, and we only have a couple more doses of medication. 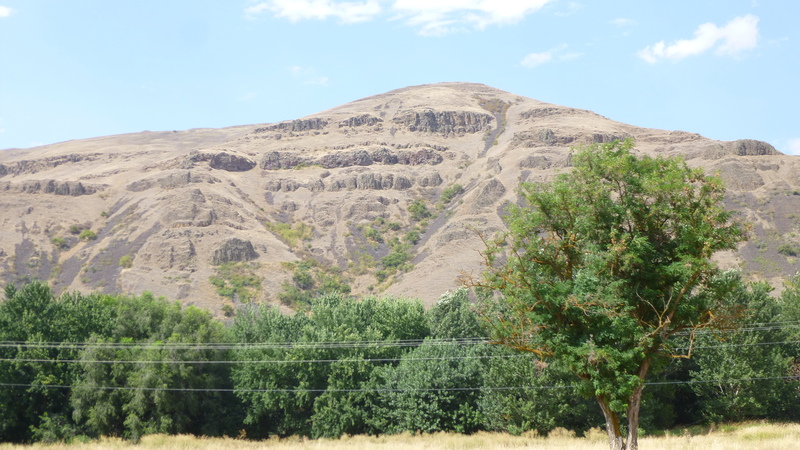 Then we began to climb in elevation – up and up 3000 feet. 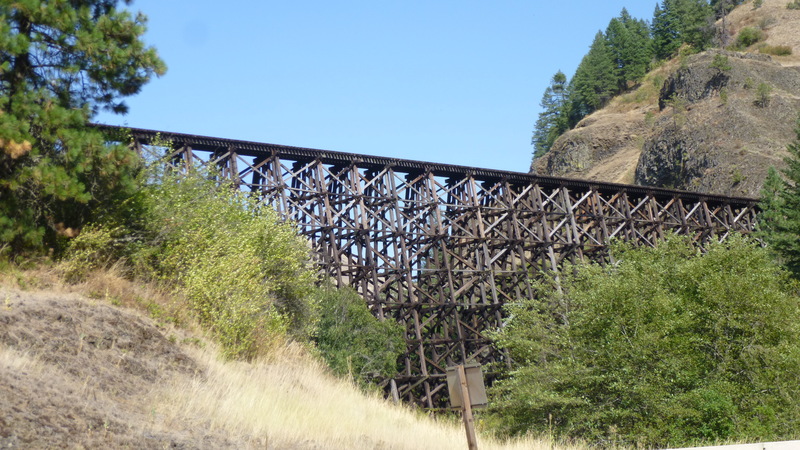 I passed a couple cool old train trestles, and one of the highway signs said this was a very difficult stretch of track to build, and several railroad companies had to work together to make it profitable. 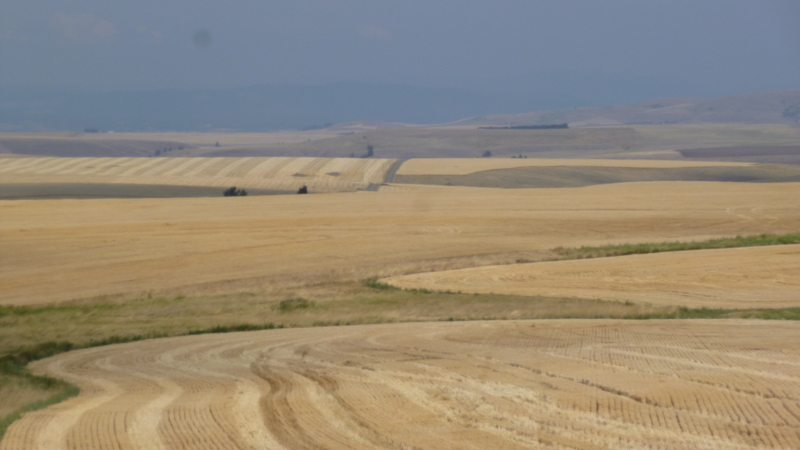 Once again, when we were done climbing through the dry landscape, the land blossomed into the rolling wheat fields stretching to the horizon. I have simply never associated wheat with Idaho (where are the potatoes?!?) 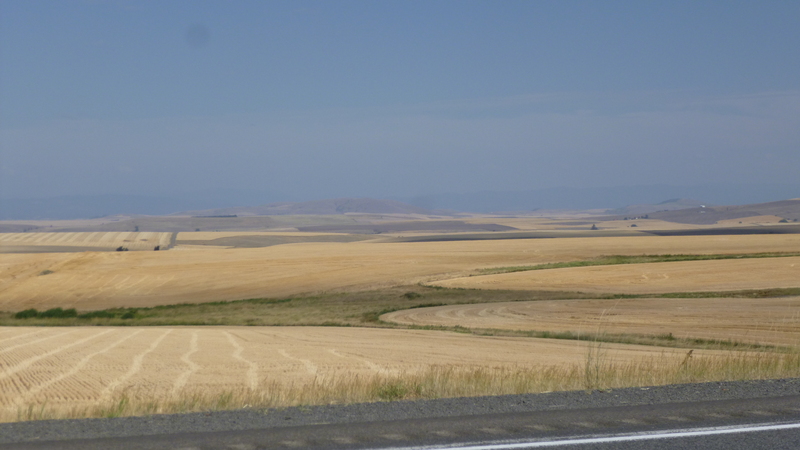 but when I stopped in the little town of Grangeville, a sign said this part of Idaho is one of the nation’s top-producing wheat areas. 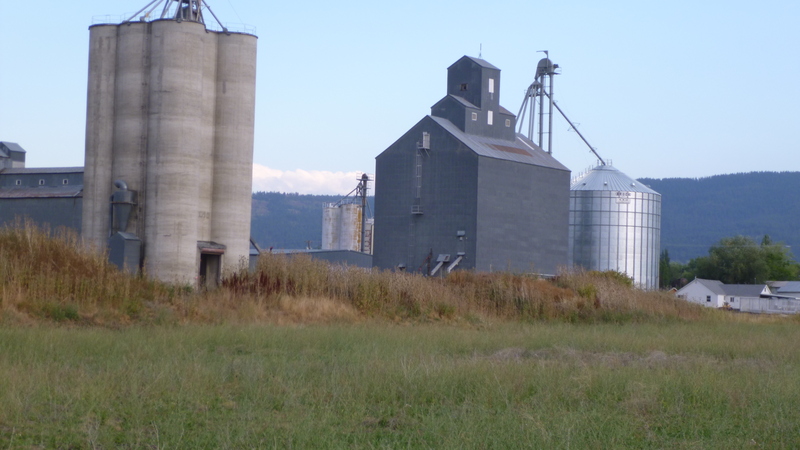 And there were a lot of grain elevators too. It just seems strange to me to have to climb up to this elevation for the wheat fields to flourish, but I think it’s something to do with the soil and all. 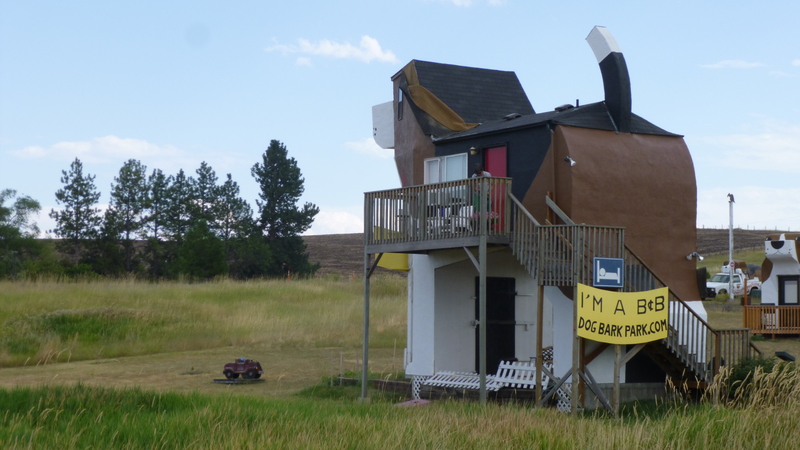 Someone also built a bed-and-breakfast building in the shape of a large dog – complete with giant fire hydrant. I never know what I’m going to see! 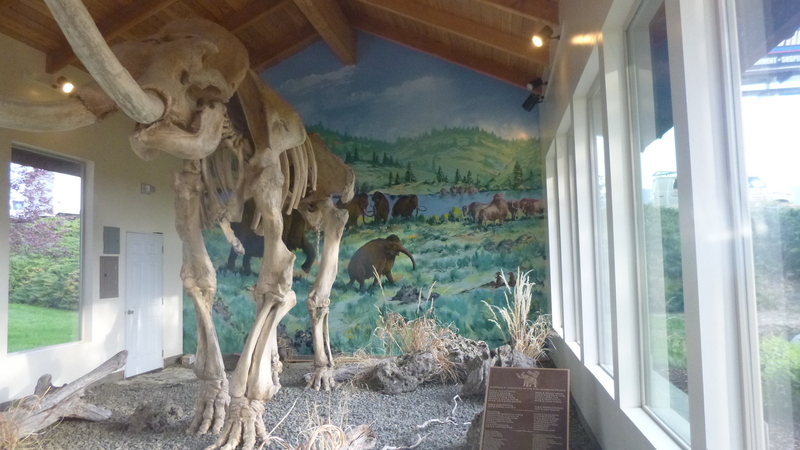 The chamber of commerce in Grangeville had built a big glass “house” for a replica of a mammoth skeleton – there was a lake about 5 miles away where a surprising number of mammoth bones were discovered in the 1990s when they were dredging it out for better boat access. 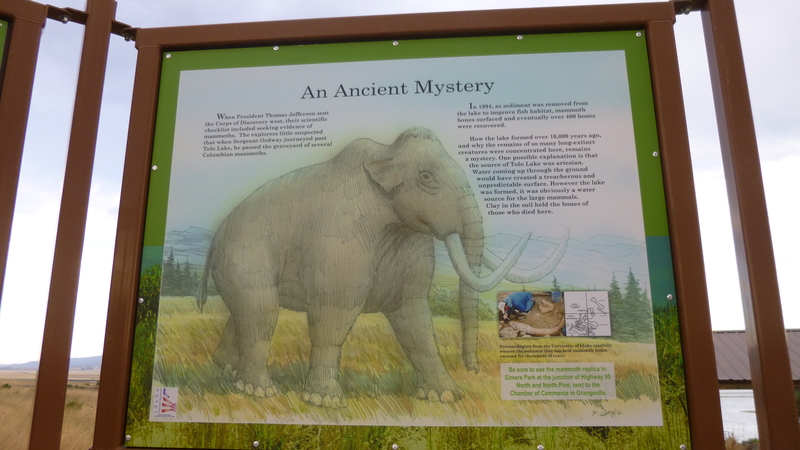 It still seems to be a bit of a mystery why so many mammoth bones were found in this spot. 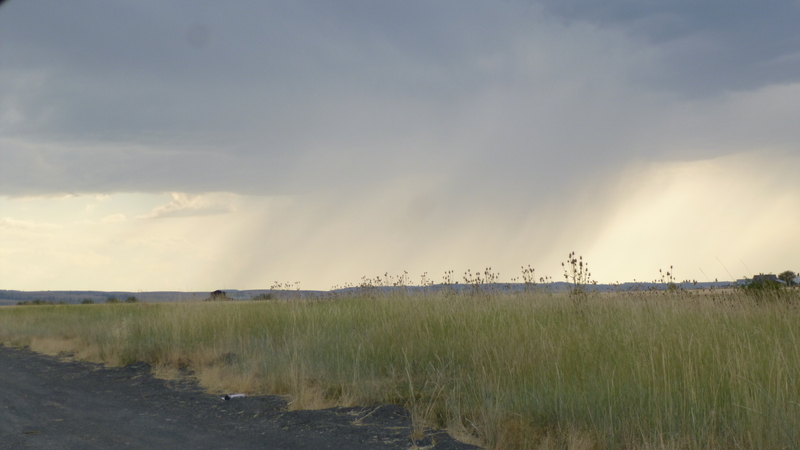 I drove out there to look at the lake – it was pretty driving on narrow roads through the farm land. 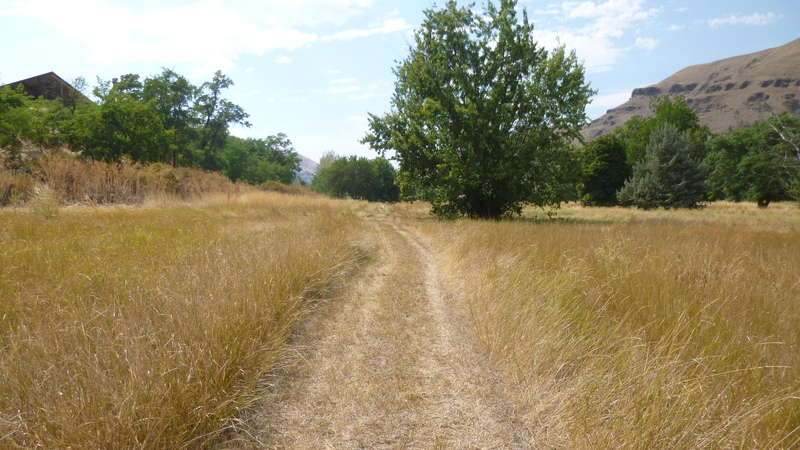 And then, just as suddenly as the land had opened up for all the wheat fields, it began to fold up again, and the road went into a long steep descent – I coasted for miles heading down into a canyon sort of area. 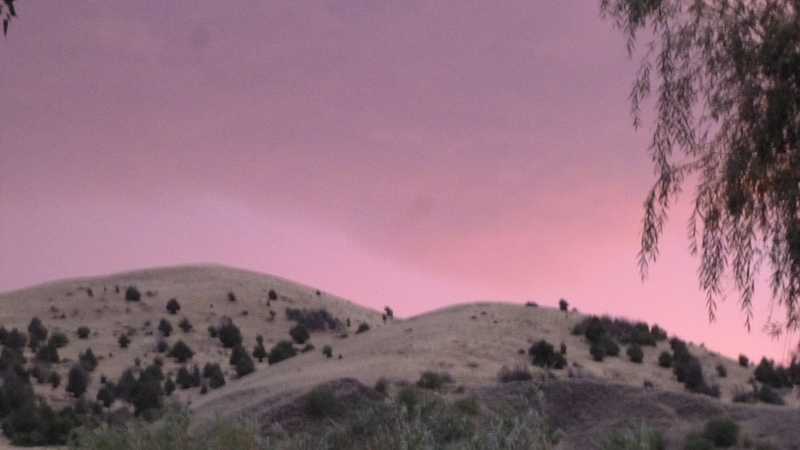 It was just beginning to get dark, and I figured I better start looking for a campground. I was in a pretty remote area, and didn’t want to be looking for a place to stop in the dark. I came to the tiny town of White Bird, and found a nice little campground that had some open sites along the river. 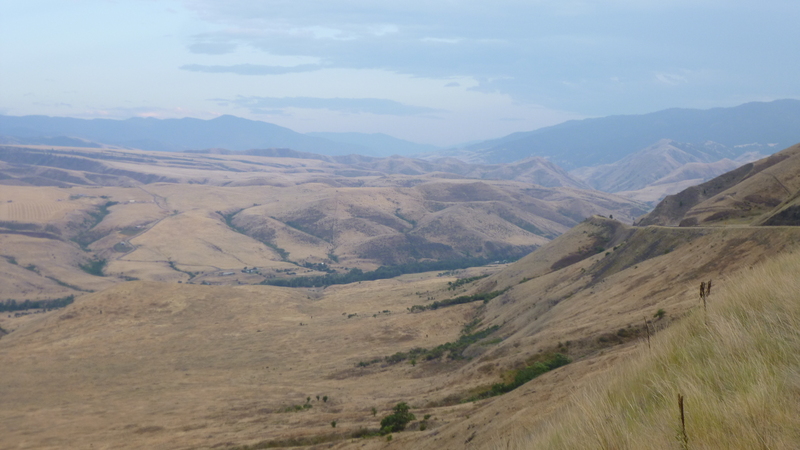 I was talking with the lady about another one of the Nez Perce national park sites nearby and asked her about the trails I had read about, and she said I didn’t want to head over there now – that was in snake country (all dry and sagebrushy) and with the heat of the day gone, this was the time of day the snakes would be out and moving around. 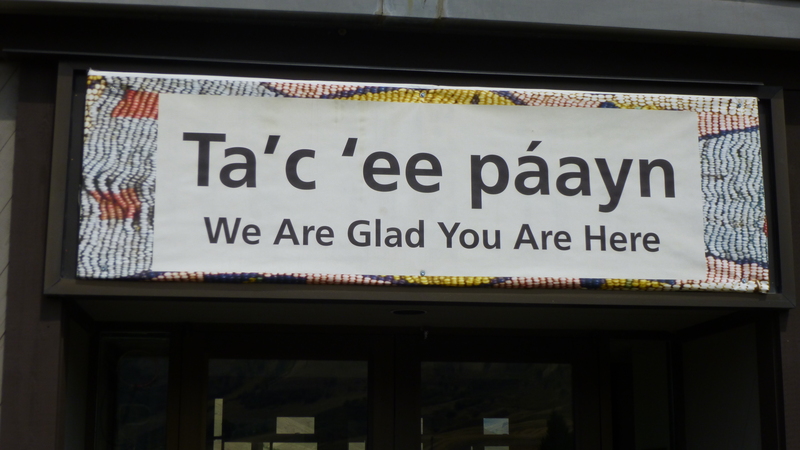 I told her she didn’t need to say another word – I was glad I had asked! The town and campsite were along the Salmon River, so things were green and nice where I was. Some heavy clouds were moving in with the darkness anyway, which made for some pretty pink reflections on the clouds, so I got set up for the night, and just in the nick of time. The clouds burst, and there was thunder and lightning and lots of rain, but Tula was curled up on the air mattress and I was comfy reading in the front passenger seat to be out of the rain. They even unexpectedly had wi-fi at the bottom of this canyon, so I could take care of some emails too. The storm passed and the rest of the night was peaceful.